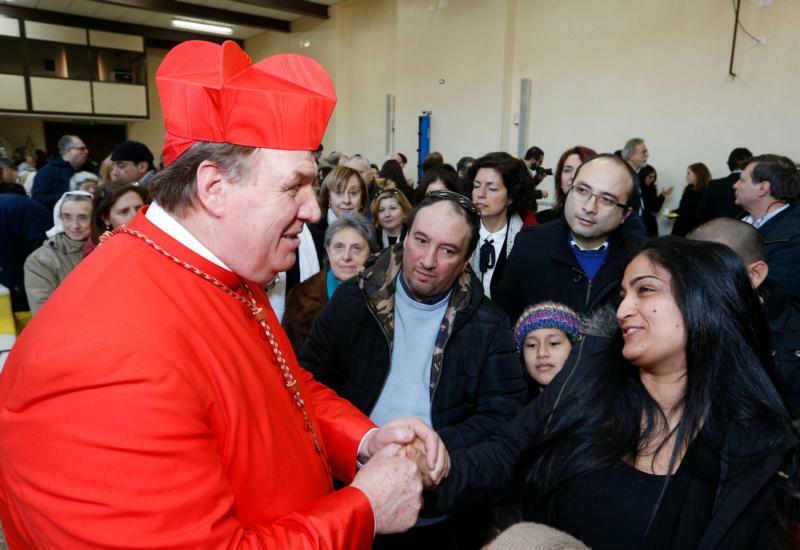 ROME (CNS) — Flanked by the parishioners and well-wishers he called his “new family,” Cardinal Joseph W. Tobin of Newark, New Jersey, celebrated Mass at his titular church in Rome. The cardinal formally took possession of the Church of St. Mary of the Graces Jan. 29. The church is located just a short distance from St. Peter’s Basilica. Arriving dressed in his cardinal-red cassock, Cardinal Tobin was greeted by Father Antonio Raimondo Fois, pastor of St. Mary of the Graces, and presented with a cross which he solemnly kissed before he entered and blessed the people in the packed church. “Today we implore Mary’s help and graces, and we beseech her to accompany us in the great adventure of becoming missionary disciples of Jesus Christ, the Most Holy Redeemer,” said the cardinal, a former superior general of the Redemptorist order. At the end of Mass, Father Fois thanked Cardinal Tobin for his closeness to the parish and its namesake, telling parishioners that he was surprised by the cardinal’s gesture of wearing a ring bearing the image of Our Lady of Grace, which he had given the cardinal as a gift. “I never would have expected that he would remove the ring given to him by Pope Francis and place instead the ring of Our Lady on his finger,” Father Fois said. Raising his hand high, Cardinal Tobin showed the ring to the parishioners, who responded with thunderous applause. The pastor also asked parishioners to pray for Newark Auxiliary Bishop Manuel A. Cruz who was assaulted while celebrating Mass Jan. 28 in the Cathedral Basilica of the Sacred Heart. Jim Goodness, archdiocesan spokesman, told Catholic News Service Jan. 29 that Bishop Cruz received 20 stitches and, although unable to celebrate Mass, he went out to greet parishioners and well-wishers after Sunday Mass at the cathedral.